Holy hell, look what's crawled out of the New Bedford, MA area! 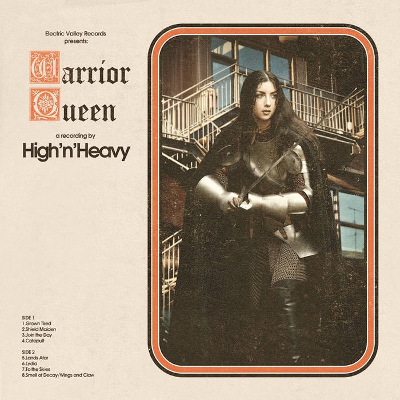 High n' Heavy bring the New England stoner rock on their 2nd album. The first song 'Grown Tired' thunders along with a great midpaced riff a bit reminiscent of Sab's "Lord Of This World" and it is totally awesome. We have some tasteful (non overdone) organ in the more relaxed second song 'Shield Maiden', and again in the intro to the third song 'Join The Day'. This tune quickly explodes into a bombastic, screaming deluge an almost punky/NWOBHM riff-a-rama which (thrash fan that I am) was awesome to hear. The fourth song, 'Catapult' (my favorite on the record), is even more of the same proto punk goodness, rounding out side one of this awesome LP. Side 2 starts out slower, heavier, and more plodding with “Lands Afar”, followed by another great burner called 'Lydia'. Rounding out side two is the mellower intro-ed “To The Skies” and then finishing with another great mid paced rager 'Smell of Decay/ Wings And Claw'. I really like the aggression and focus of this album, especially in comparison to a lot of the spaced out/hippy/mellow tendencies of many other bands in the 70’s rock revival genre. This album never really gets too slow or too mellow and it NEVER gets boring. Worth it for the song 'Catapult' alone. For fans of Black Sabbath, etc.